Now I should just warn up front, SUN didn’t really have much of a TV deal and not many of their events aired. This event was crammed down to a one hour show, so some of the matches will be heavily clipped, including one of the matches I was most looking forward to. Thus is life. The show begins with one of SUN’s young wrestlers against veteran uber heel Uematsu. The match recap showed that Uematsu’s heel tactic was taking scissors to the ring to cut off her opponent’s clothes, if that sets the stage a bit. Maemura debuted in 2001 in AJW and bounced a round a bit after AJW closed before joining ZERO1/SUN in 2006, where she stayed until she retired from wrestling in 2009. Maemura slaps Uematsu’s face before the match starts but then turns her back, allowing Uematsu to hit a dragon suplex hold. Uematsu gets a pair of scissors and tries to cut off Maemura’s outfit, but Maemura slides away and kicks the scissors out of her hand. Dragon suplex hold by Maemura, but Uematsu gets a shoulder up so she hits rolling German suplexes for another two. Uematsu bails out of the ring, Maemura goes up top but Uematsu spits water in her face and pushes her back into the ring. Missile dropkick by Uematsu and she hits a superkick, Uematsu goes up top but Maemura gets her feet up on the dive. Uematsu lands on her feet and goes for another top rope move but Maemura dropkicks her while she is on the way down. Another dropkick by Maemura and she hits a swinging neckbreaker. Fisherman suplex hold by Maemura, but it gets a two count. Maemura goes off the ropes and rolls up Uematsu for two, she then puts her onto the top turnbuckle but Uematsu blocks the Frankensteiner. Missile dropkick by Uematsu and she hits a German suplex hold, but Maemura kicks out. Dragon suplex hold by Uematsu but she lets go of the hold so she can nail a wrist-clutch Fisherman Buster for the three count! A good way to kick off the event. 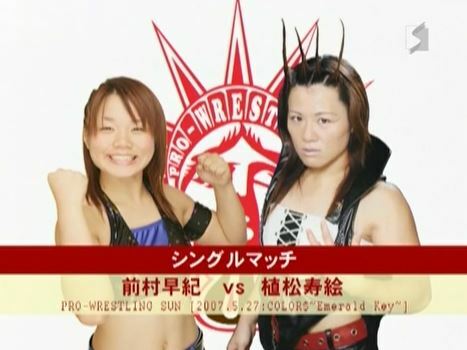 This was clipped in half or so but everything they showed was on point, Maemura didn’t have a career of note but she was a very solid wrestler with good looking suplexes and showed quite a bit of fire. 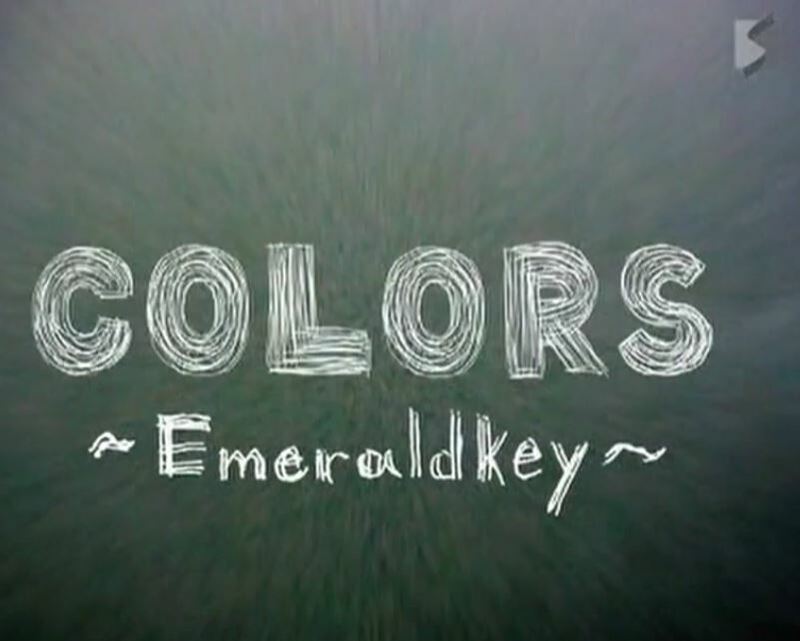 Uematsu was good too of course, and there was never a dull moment in what they decided to show us. A nice start, just too clipped to recommend. This match is for the WORLD-1 Women’s Championship. If you haven’t heard of this title before, that’s ok, as it didn’t really have a storied history. It was originally created in Pro Wrestling WORLD-1, which was Steve Corino’s US promotion that was at one point affiliated with ZERO1. The promotion had a fair number of titles, one of which was the WORLD-1 Women’s Championship, which went through a few name changes but hasn’t been defended since 2011. Natsuki won the title from Amazing Kong in February of 2007 and soon entered into a feud with the veteran Kimura, who was wrestling a brutal style at the time as we will find out in a minute. This was still early in Natsuki’s career, as she would go on later to become a star in NEO and then Stardom before retiring in 2014. Natsuki attacks Kyoko before the match starts and dropkicks her out of the ring, but Kyoko throws her into a row of chairs and stacks up chairs on the floor. She tries to suplex Natsuki on the chairs but Natsuki reverses it with a DDT. Back in the ring, Kyoko has managed to get a weapon and hits Natsuki with it, they leave the ring again and Kyoko beats Natsuki up into the crowd. A table is set up under the balcony, Kimura climbs on top of it as Natsuki is put on the table and dives down onto her opponent (table doesn’t break of course). Kimura gets a chain and wraps it around Natsuki’s neck before throwing her down the stairs. Natsuki is bleeding by now as Kyoko continues carrying her around the crowd, they finally get back in the ring and Kyoko rakes Natsuki’s face with a barbed wire stick. With the chain still wrapped around Natsuki’s neck, Kyoko hits her with it once but Natsuki ducks the next attempt. Kyoko knocks her to the mat anyway, she takes off the chain and slams Natsuki onto a stack of chairs before hitting her with one. Kyoko tries to hit Natsuki with the barbed wire stick but Natsuki ducks it and kicks a chair into her. Powerbomb by Natsuki into the stack of chairs, Kyoko crawls to the corner to get her chain however and she hits Natsuki in the head with it. More chairs are put on the mat as Kyoko picks up Natsuki and suplexes her onto the stack for a two count. Natsuki sneaks in a sunset flip by Kyoko gets out of it by hitting her with a chair, she slams her into the chair stack and puts a chair on her chest before going up top, but Natsuki gets up quickly and hits an avalanche armdrag onto a chair. La Magistral by Natsuki, but it gets a two. Natsuki goes off the ropes but Kyoko hits a chokebomb onto the chairs. Kyoko’s friend tries to help but it backfires, Natsuki goes for the Yoshi Tonic but Kyoko blocks it and drops Natsuki onto a chair. Kimura gets the chain and wraps it around Natsuki’s neck, Natsuki gets away and goes up top but Kyoko pulls on the chain to send her back to the mat. Big Boot by Kimura, but Natsuki kicks out of the cover. Kyoko picks up Natsuki and literally hangs her over the top rope, she struggles for a brief moment but quickly submits! Your winner and new champion: Kyoko Kimura! If I do much of an intro here it will be longer than the match since it was clipped to hell. Yokota of course is one of the best Joshi wrestlers in history, why she is teaming with El Blazer (aka Yoshitsune aka Sugi aka etc.) I have no idea. Corino worked closely with ZERO1 so that is why he is here, and Panther Crow was green as grass but is better known to US fans as Rhaka Khan in TNA. She is probably the biggest reason this match was so clipped but it also had the least storyline attachment, I legitimately have no idea why this match exists. Blazer and Corino start the match and trade chops, Blazer flips away from Corino and hits a headscissors, Corino calls out of the ring and Blazer does a fake dive as Corino bails from ringside. Corino returns as Yokota comes in the ring, Yokota won’t shake his hand so he tags in Panther. Wristlock by Panther but Yokota avoids her Space Rolling Something in the corner and slaps her. Panther hits the Space Rolling Elbow on her second try and hits a modified STO before covering Yokota for two. Panther puts Yokota on the top turnbuckle but Blazer knocks her down with a rope running dropkick. Corino scoop slams Yokota but Blazer knocks him out of the ring with a swandive dropkick. Yokota suplexes Panther off the top turnbuckle and then hits a Fisherman Buster for the three count! Yokota and El Blazer are the winners. Believe it or not this match went 18 minutes and was clipped down to about…. three. Which may be for the best although I still would have liked to see more of it just to see El Blazer and Yokota interact more. More bizarre than anything else. This match is for the EWA World Ladies Championship. Another title you likely haven’t heard of, as this one originated in the European Wrestling Association and was first held by Wesna Busic. 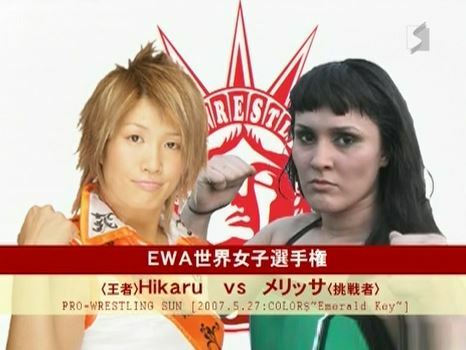 Hikaru defeated Busic on January 14th, 2007, although I am not sure exactly how many defenses she had between winning the title and her match here with Melissa. Cheerleader Melissa is of course very well known as she has been one of the biggest stars in SHIMMER plus now wrestles in Lucha Underground. Hikaru spears Melissa as soon as the match begins and dropkicks her into the corner, she goes for another spear but Melissa knees her in the head and Hikaru rolls out of the ring. Melissa goes out after her and throws her into the chairs at ringside, but when she tries again it is reversed. Melissa slams Hikaru onto the table before rolling her back into the ring and hitting a Curb Stomp before raking at Hikaru’s face. Melissa’s friends (including Panther Crow) come in the ring and they all attack Hikaru in the corner, German suplex hold by Melissa but it gets a two count. Melissa goes up top but Hikaru slaps her and joins her so she can hit an avalanche Falcon Arrow. They trade elbows as they get up, Melissa goes off the ropes but Hikaru catches her with a lariat. Fisherman Driver by Hikaru, but the cover is broken up as Melissa gets more help. Butterfly Effect by Melissa, she covers Hikaru but Hikaru gets a foot on the ropes. She goes for another one but Hikaru flips out of it and hits a Backstabber. Quick roll-up by Hikaru and she gets the three count! Hikaru is still the champion. This was pretty clipped up, what they showed us was good but not outstanding. A bit too much interference, which is mostly annoying because Melissa doesn’t need it, Hikaru’s comebacks were all fine but due to clipping it was hard to get emotionally invested in the match. A so-so match with not a lot shown and a quick ending that wasn’t overly satisfying. 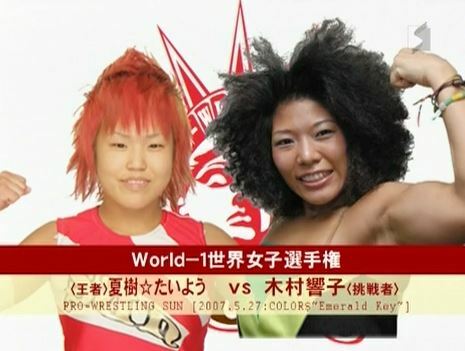 This match is for the vacant AWA World Women’s Championship. The match uses Elimination Rules, so it is not first pinfall/submission gets the win. I am not going to dive into the sketchy history of this title, technically it traces back to the American Wrestling Association Superstars of Wrestling based out of Minnesota, basically a re-start of the old school AWA that was active in some form from 1996 to 2009. The title ended up in Nanae Takahashi’s hands in late 2006 and it was defended until mid 2007 so it had a pretty short life. Amazing Kong and Takahashi had been feuding for awhile, and Wesna Busic was (and still is) a German wrestler that frequented Pro Wrestling SUN. Kong and Busic work together to start to double team Takahashi, kick by Busic and Kong knocks down Takahashi with a lariat. Kong hits Busic by accident, giving Takahashi a chance to hit her with a sidewalk slam. Dropkick by Takahashi to Busic and she puts Kong in a armtrap crossface, Busic tries to break it up for some reason but Takahashi puts her in a figure four while keeping Kong in the crossface. Back up, Takahashi goes for a springboard double armdrag but the Gaijin block it and kick her to the mat. Kong gets on the second turnbuckle but Takahashi avoids the diving, Busic slam Takahashi and applies a bridge but Kong knocks down the referee so he can’t make the count. Busic and Kong argue over who should pin Takahashi, Takahashi tosses Busic out to the apron and shoulderblocks Kong. Busic goes up top but Takahashi joins her, Kong grabs Takahashi from behind and powerbombs her to the mat. Takahashi goes off the ropes but Kong blocks the Shining Wizard, Busic is back and kicks Takahashi before hitting a swinging side slam in front of the corner. Cover by Busic, but Kong comes down onto both of them with a diving body press. Double underhook facebuster by Kong to Takahashi, but the cover gets two. Spinning backfist by Kong to Takahashi but Takahashi hits a cutter, Takahashi then back bodydrops Kong out of the ring before diving out onto Busic with a tope suicida. Kong comes in with a chair, she gives it to Busic but Busic hits Kong with it. Small Package by Busic to Kong for two, Takahashi then rolls up Kong and Busic joins in with a jackknife as they keep down Kong for the three count! Kong is eliminated from the match. Takahashi charges Busic in the corner but she jumps out to the apron and Busic hits a lariat. Busic then pulls Takahashi out to the apron with her, she picks her up and drops Takahashi with a back to belly piledriver. Busic gets Takahashi back into the ring and hits a Styles Clash, cover by Busic but it gets a two. Busic goes for another back to belly piledriver but Takahashi blocks it and rolls up Busic for two. Busic goes up top and goes for a cannonball, but Takahashi catches her and hits a powerbomb. Shining Wizard by Takahashi and she hits a jumping kick to the head, Takahashi goes off the ropes but Busic catches her with a Death Valley Bomb. Big boot by Busic but Takahashi fires back with a lariat. Heel kick by Busic but Takahashi palm thrusts her into the corner. Takahashi puts Busic on the top turnbuckle, she gets her in the Muscle Buster position and drops Busic with a Nanaracka*100 for the three count! Takahashi is your new champion! Three way matches are generally not great, they need a really tight structure or they tend to suffer from illogical moments or wrestlers ‘disappearing’ for awhile when it isn’t their turn. This match didn’t have a lot of disappearing but it did lack logical in times, since it was elimination rules it didn’t make a lot of sense for Kong and Busic to be breaking up each other’s pins and the main story of the match was them bickering. Which is ok for a cute opening match but seems a bit below the main event title match of an event. The match got better when it was just Busic and Takahashi, however that only lasted a couple minutes. Overall a disappointing main event, any combination of these three in a singles match would have been a lot better. It is difficult to give a fair review of an event when only one hour was shown, however not a lot of SUN made air so we make the best with what we can do. The Kimura/Taiyo match was over the top brutal, mostly in a good way as Taiyo is such a sympathetic babyface since she looks like a child and Kimura beat her senseless. Nothing else really jumped out here unfortunately as the other matches were clipped and the main event ended just as it was reaching its potential. I am not sure if there are better SUN events out there, but this one can be safely skipped, I’ll keep looking to see if there is something else from SUN that I can give a recommendation to.